Glenda is a native of Arkansas but she has lived near Houston, Texas for nearly forty years. She comes home to Arkansas every year to visit family and fly fish the Little Red River. 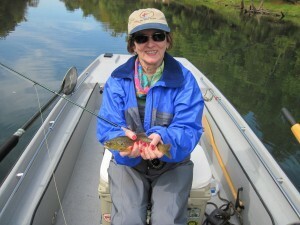 Today was a beautiful fall day and we enjoyed guiding Glenda on another fly fishing trip in her home state. 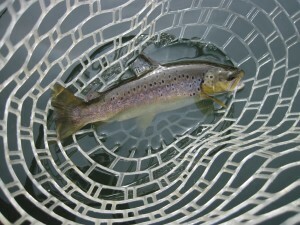 Glenda caught and released and amazing number of nice Rainbow Trout and this dandy Brown Trout all on a #16 Chronic Sowbug. The Little Red River is in great shape and it looks like we are going to have absolutely spectacular fall foliage. The fly fishing is great and we still have a few prime fall dates so book your fall fly fishing trip with Empty Creel Fly Fishing Guides and Outfitter soon!